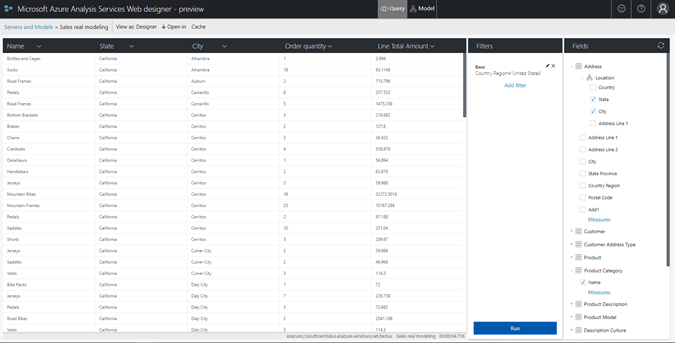 In July, we released the Azure Analysis Services web designer. This new browser-based experience allows developers to start creating and managing Azure Analysis Services (AAS) semantic models quickly and easily. While SQL Server Data Tools (SSDT) and SQL Server Management Studio (SSMS) are still the primary tools for development, this new experience is intended to make modeling fast and easy. It is great for getting started on a new model or to do things such as adding a new measure to an existing model. Today we are announcing new functionality that will allow you to generate, view and edit your DAX queries. This provides a great way to learn DAX while testing the data in your models. DAX or Data Analysis Expressions is a formula language used to create custom calculations in Analysis Services. DAX formulas include functions, operators, and values to perform advanced calculations on data in tables and columns. To get started open the web designer from the Azure Portal. Once inside the designer, select the model that you wish to query. 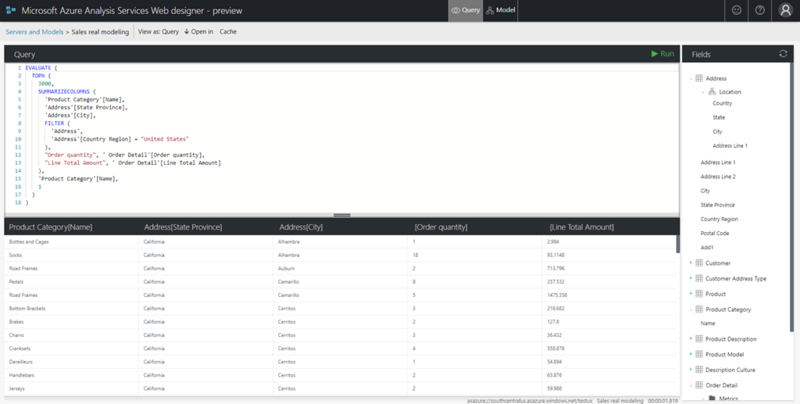 This opens up the query designer where you can drag and drop fields from the right to graphically generate and then run a query against your model. Now switch the view from designer to query. This will bring up the new query editor with the DAX query that was generated from the query that was graphically created in the previous steps. The query text can be edited and rerun to see new results. You can try the Azure Analysis web designer today by linking to it from a server in the Azure portal. Submit your own ideas for features on our feedback forum. Learn more about Azure Analysis Services and the Azure Analysis Services web designer.